COCOA OC is turning 42! 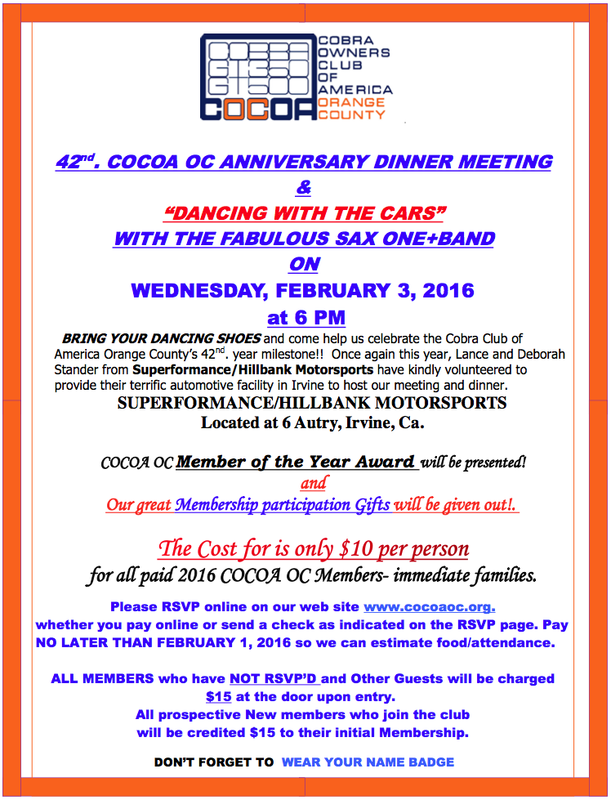 Please join COCOA OC as we celebrate our 42nd Anniversary at the Superformance/Hillbank Motors facility, located at 6 Autry, Irvine on Wednesday, February 3, 2016 at 6 p.m. Once again this year, Lance and Deborah Stander have kindly volunteered to provide their terrific automotive facility to host our meeting and dinner. The evening will include dinner, dessert, beverages and dancing with live entertainment. Additionally, the COCOA OC Member of the Year Award will be presented and our great Membership Participation gifts will be given out as well! Don’t forget your name badge and we hope to see you there! Eve and I will be attending the Feb 3rd event. check will be sent via mail. Thanks Richard for letting us know. However the event organizer may not see this comment so please RSVP via the link in the event post so we can have an accurate count. Carol and I will be attending the Feb 3rd meeting. Payment via US mail. Thanks Randy for letting us know. However the event organizer may not see this comment so please RSVP via the link in the event post so we can have an accurate count. Ed and I will be attending. Will put check in mail today. I was unable to find the Paypal link to pay for the anniversary dinner. Hi Ellen! As the email and the posting says, you need to be logged into the COCOA OC website in order to see the RSVP link. Then once you RSVP, as always, a link will appear on the center of the page saying that you can pay via PayPal. It was there for me and I was able to do so. It is small so you might have missed it. Thanks!